Hi there! 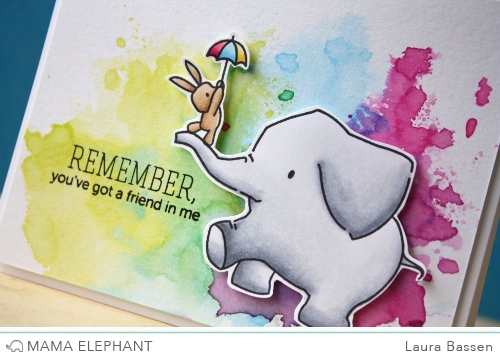 Laura here and today I have a project to share using the Ella & Friends stamp set. I perched the bunny with the tiny umbrella on top of the elephant's trunk. Literally, can't handle the cuteness!! Laura's card is absolutely adorable! She really knows how to bring these images to life...WOW! Oh WOW I can do backgrounds like that with no painting skills! I'm so excited to try this out. Thanks for sharing. So absolutely smitten with this, Laura. As always, I love your videos, too! This card is adorable and I loved learning how to smoosh my inks! Thank you, Laura, for another great video! Fabulous as always Laura!!! I must try smooshing!!! Thanks for tips! Oh my goodness Laura, your smooshing/dabbing is fantastic and I just love the effect and I'm definitely going to give that a try. You're right about the cuteness and putting a smile on someone's face - totally! Such a cute card! I love the effect with distress inks. I'm going to try it.Thanks for this video! Great Card! Love the colors and smooshing. I have 11 yr old and 16 yr old girls. I understand about hissy, fussy, drama! LOL! luv your card and commentary - made my day! 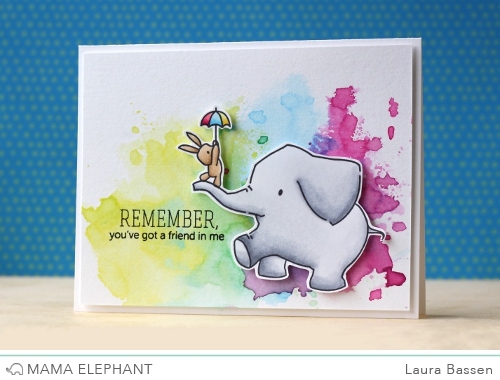 Hi Laura, I loved your colouring with the copics on the little elephant. Fussy cutting the Laura way - who needs the coordinating cuts??? Means I can buy more stamps! Yeeha!